A medicated mixing mineral for sheep of all ages, Southern States Sheep Mineral with Zinpro (BVT) Medicated is a source of many vital nutrients essential for good health. This mineral contains (BVT ) for the prevention of coccidiosis in sheep maintained in confinement. 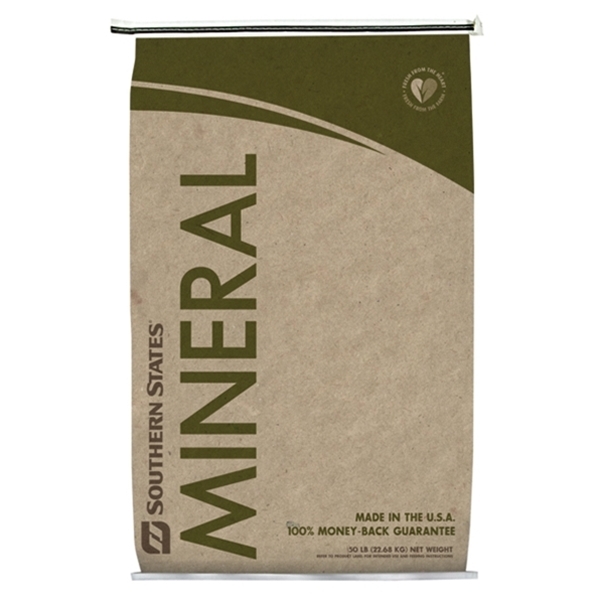 Southern States Sheep Mineral with Zinpro (BVT) Medicated contains the maximum allowable selenium level with vitamin E to prevent white muscle disease and improve immune system response. This mineral also contains organic zinc methionine, which supports healthy hoof condition and wool quality. Feed Sheep Mineral W/Zinpro (BVT) Medicated continuously to sheep maintained in confinement at the rate of 0.4 to 1.86 ounces along with a non-medicated sheep protein supplement, farm grains, silage or hay to provide not less than 15 nor more than 70 mg of Lasalocid per head per day depending on bodyweight. Feed 1 to 4.6 lbs. of the 16% or 13% Protein Mix to provide 15 to 70 mg per head per day of Lasalocid. Vaccinate for enterotoxemia (overeating disease). Always offer clean water free choice. NOTE: Do not feed to goats. Do not permit intake of supplemental selenium to exceed 0.3 ppm in the total ration. Feed 1 to 4.6 lbs. of the 16% or 13% Protein Mix to provide 15 to 70 mg per head per day of Lasalocid. Vaccinate for enterotoxemia (overeating disease). Always offer clean water free choice. NOTE: Do not feed to goats. Do not permit intake of supplemental selenium to exceed 0.3 ppm in the total ration. Caution: The safety of Lasalocid in unapproved species has not been established. Do not allow horses or other equines access to feeds containing Lasalocid as ingestion may be fatal. Mix thoroughly with grain and/ or roughage prior to feeding. Feeding undiluted or mixing errors may result in an excess Lasalocid concentration which could be fatal to cattle and sheep.